You are telling a story to your run buddy. All of a sudden, you completely forget what you were talking about. On Saturday I experienced total runner’s brain. At mile 8.5 of my 18 mile run, I came across a couple of buddies from my running group (I was running with the group at large, but was basically solo by that point). I decided I wanted the company, so I turned around and ran with them for a bit. That “detour” added over a mile to my run — turning 18 miles into 19+. Which I somehow just didn’t think about at mile 8.5. Let me tell you – I thought a heck of a lot about it at mile 18.5. 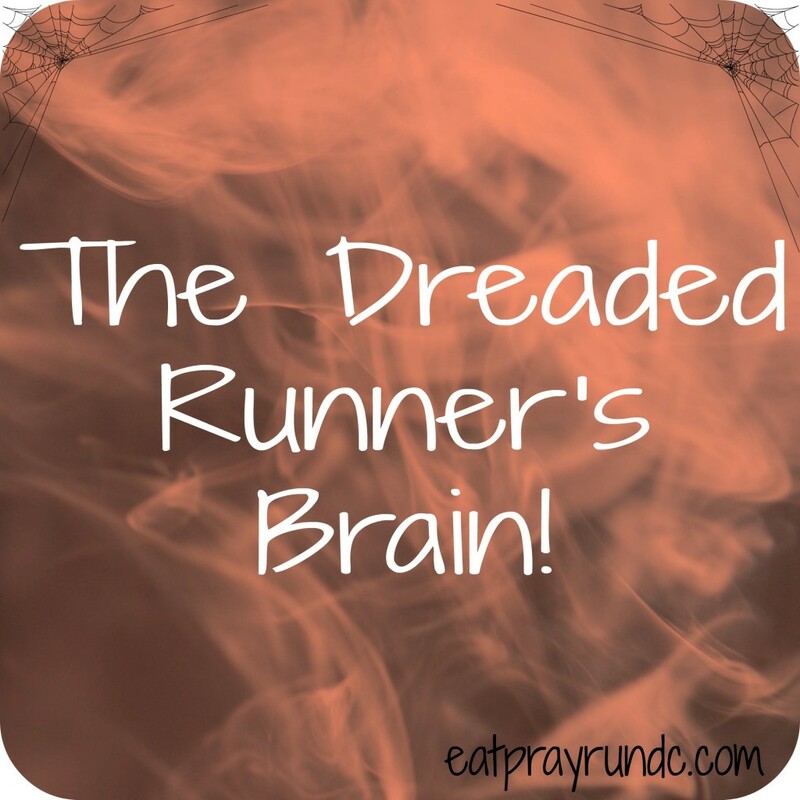 UGH – RUNNER BRAIN! Have you ever experienced runner brain? Haha…been there. What about the combo of Mommy + Runner Brain. Ugh! Haha I literally can’t do math while I run. I always think I’m going slower than I am which makes for a nice surprise later! And congrats on that crazy long run! Congrats on your longer than expected run! I often look at my Garmin and try to calculate while I run but I need to just stop that and enjoy the runs! Haha, definitely runner brain – it’s downright comical how hard it can be to focus during a run! Q: If I have 10 apples and you have 11 ice cubes how many pancakes will fit on the roof? A: Purple because Aliens don’t wear hats. Did you say 19 miles instead of 18. Girl! I definitely calculate what time I will or should be done by the pace I am running. Actually, I try to anticipate it before I start if I am planning on doing something later on. My runner’s brain just comes in by thinking this running is a bad idea when I get to mile 10ish or so. I try to remember why i thought this was a good idea. I have no choice but to finish running the miles or race because there is no where to go but where I am headed.